Hearty lentil beer soup stars black and red lentils plus tender potatoes and carrots, and the beverage dear to my heart, beer! This pressure cooker beer soup recipe is quick and easy to make, high-in-protein, plant-based, and tasty as all get out—a home-cooked Instant Pot soup for this busy time of year. Hi there. I’m Letty from Letty’s Kitchen blog. I develop seasonal vegetarian recipes along with desserts with a healthier twist. Soup made in a pressure cooker is practically my middle name, and I’m delighted to share this recipe with you. An Instant Pot is one of the most popular brands of electric pressure cookers. 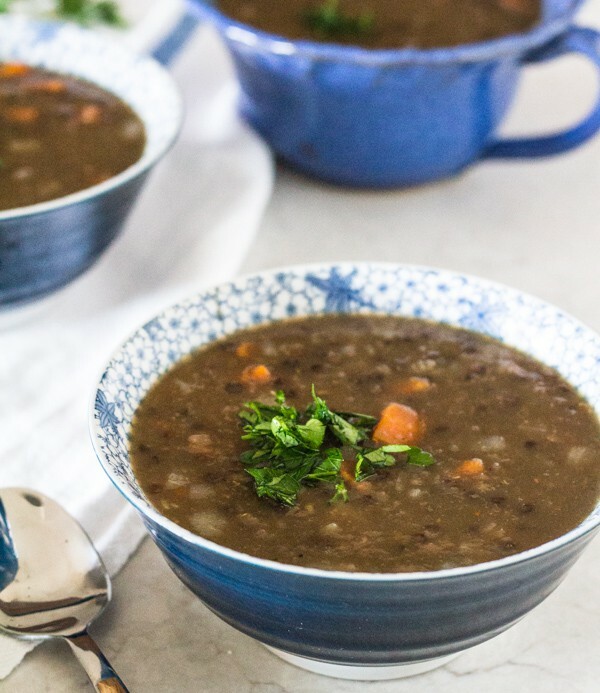 They are easy to use and your Instant Pot can help you create this Hearty Lentil Beer Soup recipe! I’ve been changing up this vegetarian lentil soup recipe since I was old enough to drink. (Not that that would have stopped me from pouring beer into my soup.) Named “lentil wunderbar soup”, the recipe is scribbled in an old notebook, at the top of a tattered yellowed page. If you know where this recipe originates, please write. What I know is wunderbar in German means wonderful. With carrots providing sweetness, and a sour spoonful of vinegar to finish, pressure cooker hearty lentil beer soup is classic German sweet and sour food. For more wunderbar-ness, another flavor dimension, stir in the beer of your choice. I used a pale brown ale. Back in the day, we knew lentils that cook into soft mushy rustic soup, regular brown lentils. Was it seasonal-cooking pioneer Alice Waters and her restaurant Chez Panisse that introduced American cooks to French green lentils, lentils that hold their shape when cooked! Now we can easily find many lentil varieties, from black belugas that also hold their shape, to red and yellow lentils that cook to a creamy texture. For this easy Instapot soup, it takes seven minutes in the pressure cooker for red lentils to melt into sweet creaminess, while black lentils keep their chewy soft texture. Wunderbar! To increase awareness of the highly nutritious lentils and their bean cousins, the United Nations declared 2016 the Year of the Pulse. With the best of intentions, my goal was to come up with a recipe showcasing pulses every month this year. Thanks to my pressure cooker, I covered 7 out of 12 months. You might want to check out January’s Potato Bean Tacos and March’s Lentil, Avocado, and Radish Salad. Pressure cooker Lentil Very Brown Rice is one my most popular recipes. Let’s not forget about Barbara’s Pressure Cooker Turkey Lentil Taco Filling. Heat the oil in the pressure cooker. Stir in the onions and carrots and sauté for a few minutes. Add the vegetable broth, black and red lentils, potato, bay leaves, thyme, salt, and pepper. Lock the lid in place and cook on high pressure 7 minutes. Quick release the pressure. Remove the bay leaves. Stir in the beer and simmer about 5 minutes. Stir in the vinegar. Taste, adding more salt and pepper if you think it’s needed. I made this tonight and felt like the beer did not cook off in 5 minutes. Next time I make it, I will probably either use less beer or give the alcohol more time to cook off. would these be dried lentils or canned. does it matter? Thanks for this question. The recipe uses dried lentils–I changed the recipe to specify and I’m glad you pointed it out! 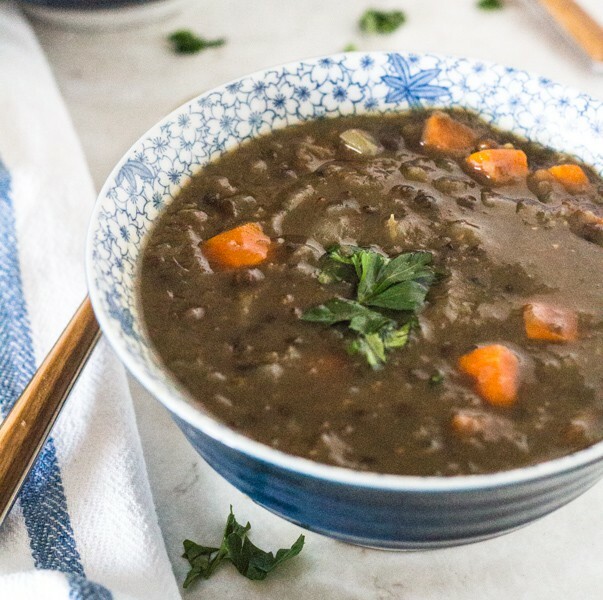 If you use canned lentils you really wouldn’t really need a pressure cooker to make this soup! I made this recipe for lunch this afternoon. Thank you! I added a dollop of plain Greek-style yogurt to each bowl. Delicious! Thank you Janine. I like the idea of adding a dollop of thick yogurt at the end! Does the alcohol evaporate during cooking? This soup sounds like something I would love, but my husband is a recovering alcoholic. The longer you cook the soup, the more alcohol will evaporate. Also, it’s 12 ounces of beer in 80 ounces of soup. The best to be sure is to use a non-alcoholic “beer” like O’Douls. I put a link to a review of N.A. beers in the post. Enjoy. Alcohol evaporates at about 160 degrees F. Alcohol residue from the beer is not an issue.